What is a Slip Resistant Ceramic or Porcelain Tile? 1. Consumers, and indeed many builders and architects, do not realise that ceramic tiles which have had their slip resistance tested are awarded a grade, score or rating. In the absence of this knowledge, it is therefore presumed by many people that a floor tile is simply either anti-slip or not, when in reality this is not a binary situation. Different tiles have different degrees of resistance, and this will be reflected in their rating. From that perspective, there is no such thing as an “anti-slip” tile, as every tile will fall into one of the rating categories. 2. While most other properties of a floor tile, such as abrasion resistance or strength, have an internationally agreed upon method of testing, none exist with regards to slip resistance. All that does exist are national standards, and within the EU, some guidelines. This has resulted in different countries using different rating scales from each other, and the testing procedures themselves bear little similarity to each other. The results from one set of tests do not correlate directly with those from another. This might seem like an easy problem to solve. However, it's complicated somewhat by representatives of other flooring industries, such as wood or vinyl, weighing in to any discussions with their own concerns and opinions, in an attempt to homogenise all building regulations. And of course, the number and nature of accidents involving slipping mean this is a much more important and widespread area of concern than the likes of chemical resistance, for example. This makes it even more difficult to achieve consensus. To date, there is no single, universal, and internationally accepted slip resistance test. 3. The terms “anti - slip”, or “slip resistance”, can be quite subjective. There is, for starters, a difference between actual slipperiness, and perceived slipperiness. A consumer or member of the public will modify their behaviour, for example, walking up an incline, or downwards on a wet surface. If a floor is continuously wet, it could be argued that a dry test rating is rather meaningless. A floor that is almost always exposed to dirt, abrasive material or other contaminants will perform differently in real life to its rating (which was assigned when tested perfectly clean) would suggest. There are other variables that interact with each other to determine whether a surface is “safe” or not. The speed of an individual walking or running; whether footwear is likely to be involved; the material from which the sole of any footwear might be made; whether a person is likely to be applying lateral pressure whilst turning. All told, the situation is quite the mess, despite decades of discussions between various flooring industries. Depending on what country a tile is being installed in, it’s important to understand which guidelines to adhere to. Anyone specifying or considering a floor tile for a certain application should be well informed, and should err on the side of caution. Most countries have health executive arms of government which will stipulate the relevant guidelines. The main slip resistance tests that are carried out on floor tiles are the ramp test and the pendulum test, which we discuss below. Other tests include the tortus test, a micro-roughness test, and a sled test. In the interest of practicality, we shall only touch on the tests that are by far the most prevalent in the ceramic flooring industry. This is by far the most common slip resistance test performed. The majority of European tile manufacturers are based in Spain and Italy. The slip resistance test that most of them prefer is the ramp test. One of the advantages of this test is that, described in conjunction with it, there's a distinct list of recommended applications that relate to each resistance score. This in turn leads to architects and other tile specifiers within the construction industry to favour the ramp test. The method itself involves a subject walking across the tiles under scrutiny, which are in turn fixed to an adjustable ramp. The subject wears specified safety footwear, and the surface of the tiles are covered in an oil. The angle of the ramp is increased until the subject can no longer maintain balance, and at this point the angle of the ramp is recorded. The steeper the angle, the higher the slip resistance, and the higher the score. The tile is awarded an “R – rating” between 9 and 13 inclusive, with the higher rating indicative of higher resistance. There is a table at the bottom of this article showing possible suggested applications for tiles in each rating. Note that the lowest score possible is 9. One of the disadvantages of this procedure over any other is that it needs to be carried out in a laboratory. Often situations arise, perhaps where there's been an accident or a claim, where measurements need to be taken after installation. Clearly this ramp test is of no benefit in these circumstances. The small number of different scores is often criticised as a weakness, with each rating covering a relatively wide spectrum of resistance. Also, it’s maintained that the controlled laboratory environment can be very different to that in which tiles may eventually be installed, and thus the results may be somewhat misleading. It’s also an expensive test to carry out. Having said that, the ramp test results are extremely consistent and are therefore very reliable. The video below shows the test in action. A helmeted and harnessed tester walks to the point of slippage, and then suddenly slips, while the observing scientist notes the point of failure. This is a similar test to the one above, except the participant is barefoot, and instead of oil, a solution of soapy water is used. See the end of this article for ratings and interpretations. Note that most tiles will not be subjected to this test, unless they're expected to be used in environments where they're almost always wet. In conjunction with the above tests, a separate rating can be awarded for tiles that have a raised surface profile specifically designed for an anti-slip finish in areas subjected to constant water. Such tiles would be used around swimming pools. These tiles will have studs, or raised patterns on them. It’s important that, in situ, the excess water has somewhere to drain to, away from the surface of the tiles. The “V rating” represents the drainage ability of the tile, and is used in tandem with the R rating. A combined rating can look something like this: “R12V8”. Once again, the higher the rating, the greater the drainage capacity of the tile. It’s measured in cubic centimetres per decimetre squared. This is the second most common method of testing the slip resistance of floors. Many manufacturers now perform this test as well as the ramp test. The test itself involves a pivoted arm being released in such a way that it comes into contact with the surface being tested at the bottom of its arc. The end of the arm which makes contact has been designed to simulate a shod heel, with a specified rubber pad used as the interface. Based on the extent to which the arm is slowed by friction as it passes the surface, a rating is awarded, known as the Pendulum Test Value, or PTV. The more the arm slows down, the greater the slip resistance, and the higher the score. This test can be performed for dry surfaces or those contaminated by water. The results from this test correlate almost exactly with the coefficient of friction for the surface under inspection, and is thus deemed reliable. See the end of this article for result categories. The greatest advantage this test possesses is the ability for it to be performed in situ. The apparatus is portable. As long as it is operated by a suitably qualified person, then the results are valid. Professional tile specifiers, insurance companies, and accident investigators all boast familiarity with this test for this reason. It’s also easy to compare results for clean floors and contaminated floors. It’s important that the operator is fully aware that for any given surface, the reading will be different depending on the relative orientation of the device, and that multiple readings must be taken from many angles. A tile with a relief pattern may have far greater grip in one direction than the perpendicular. It does not work particularly well on surfaces that have a very pronounced profile. It does not detail a thorough list of suggested practical applications for which a tile would be suited. The UK prefers the pendulum rating to the ramp test rating. Since the UK is only a fraction of the global market, it’s understandable that tile manufacturers will prioritise the ramp test over the pendulum test. However, the general trend is towards manufacturers providing ratings for both tests. Both tests outlined above are recognised in the UK, but most relevant in the UK is what the HSE recommends. Employers, builders, architects, and others have a duty to ensure that people are as safe as possible in any given environment. The HSE has deemed that for assessing slip resistance, the pendulum test score is accurate, robust, and valid. The tests are also performed in the locations where slipping is likely to happen. To assist professionals and non-professionals alike in determining the suitability of a surface, the HSE have developed an online tool called the Slips Assessment Tool. This can be found at http://www.hse.gov.uk/slips/sat/index.htm. This tool assists users, who can input their own measurements, to determine the risk of slipping in a particular area. As access to a pendulum tester is not required to use this software, the software is only useful as a reasonably accurate guide, rather than a definite tool. The law specifies that those responsible for an environment are required to ensure that safety is maximised. However, it does not specify exactly what tile should be used where, nor does it prohibit the use of tiles that do not have a rating. It is recommended, therefore, that the HSE guidelines are followed, and to err on the side of caution. 6 - 9 R 9 Dry transitional areas in public offices and schools. Toilet areas in offices, hotels, and shopping centres. 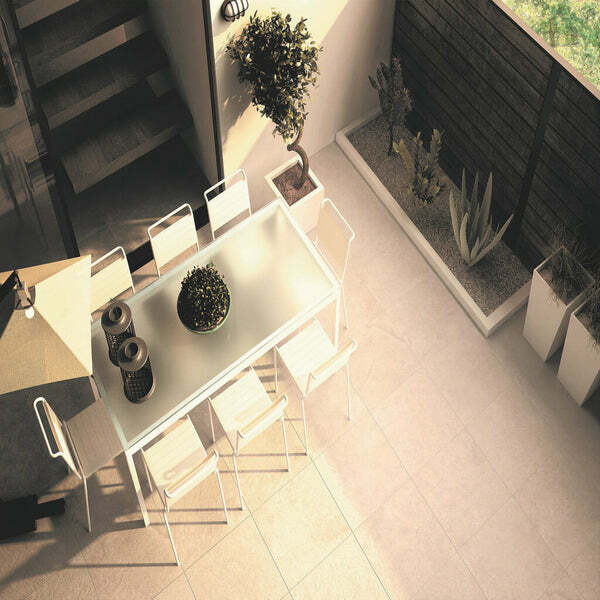 Castilla and Prisma slip-resistant tiles are examples of R10. External sales areas or ramps. Tabarca and Chicago anti slip tiles are examples of R11. Note: The slip angle is the result of the test, not an installation recommendation. The rating awarded for a tile and suggested applications are for flat areas only. Notes: No rating is awarded where the minimum angle of 12 ° is not achieved. The slip angle is the result of the test, not an installation recommendation. Note: The pendulum test has two separate “sliders”, one to mimic a shod foot, and one for barefoot.